Do pollution masks actually help to protect you? This winter has already seen harsh pollution spikes first in Harbin, and recently in Shanghai and eastern China. By coincidence I had been taking the train from Shanghai to Beijing during one of those days, and I sat mesmerized as we barreled through endless vistas of ghostly cities disappearing into the shroud. Such events, along with Beijing’s own “airpocalypse” last January, have dramatically increased public awareness and discussion about air pollution in China. Online stores are flooded with anti-pollution products; chat rooms and coffee shop conversations are filled with personal comments about their adventures with masks. Even in convenience stores such as 7-11 you can now find a big display of pollution masks stamped with N95, 99% or something similarly impressive on their labels. Let’s step back from this marketing hype — is there any evidence that any of these masks really do any good? This question is deadly relevant to me and my family, as well as to the hundreds of patients and readers who have asked me this question over the years. What is my answer? I usually tell them, as I now tell you: yes, there is evidence of benefit — sort of. There’s no medical doubt that smaller particles — the ones smaller than 2.5 microns (called PM2.5) — cause major inflammatory damage that leads to heart disease, lung disease and cancers. Quite a few studies have also shown encouraging results that lowering an area’s air pollution improves the health of the community, lowering ER visits and overall mortality. Lower your exposure, improve your health: yes, this seems obvious, but research is filled with assumptions that were proven wrong. Not in this case. Let’s return to the masks. Construction sites all over the world can be filled with dust, heavy metals, and dangerous gases. These workers, for decades, have relied on protective masks made by companies such as 3M, with proven test results from independent labs that they reduce inhaled exposure by at least 95%. 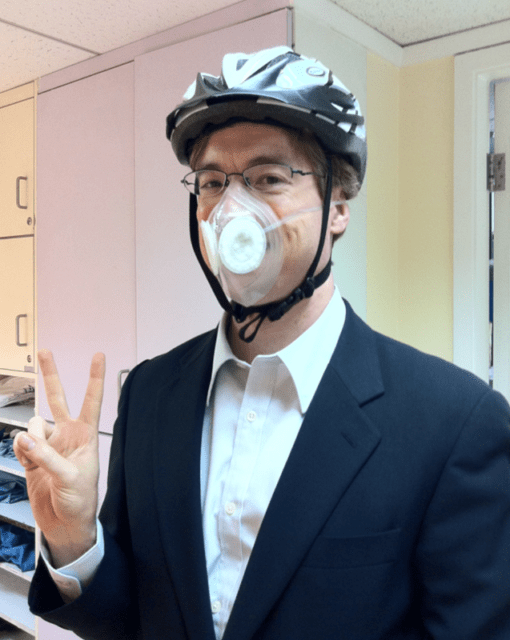 This is exactly what N95 means, a term we see often: an N95 mask, if officially certified by the National Institute for Occupational Safety and Health (NIOSH) in the USA, has passed the fit-test results on a human face. During this test, a person is wearing the mask for about 15 minutes, moving around in many positions, with the mask attached to special machines that record the concentration inside and outside the mask. If the air inside the mask is more than 95% reduced in particles, that mask passes the N95 test. Quite a few masks have this certification, and it’s for this exact reason that I am sure that these same masks can dramatically decrease all of our exposure to air pollution’s most dangerous particles, those PM0.3-PM2.5. The main problem is jumping to the next level of assumptions — that by wearing the masks, you can improve your health. Yes, again this seems logical, but to date no studies have been done which follow such mask-wearers over months and years, testing their health and looking for improvements. Most likely these tests may never be done, unless a governmental agency such as the NIH pays for it. So in the face of lack of terrific data, the best data we have are a pair of short term studies from the same team of researchers, using subjects walking around the streets right here in Beijing. These researchers, from Cambridge as well as Beijing, first tested s couple dozen healthy young subjects and had them walk around the side streets around Second Ring Road, one of our many notoriously congested highways. When they wore a mask (the 3M 8812 model), they had a large improvement in blood pressure, 7 points on the scale. But their follow up study, published last year in Environmental Health Perspectives, was much more relevant for me, as a family doctor. This time they tested people who already had heart disease — stable, but on medicines. Almost 100 people were tested this time, both with and without the same 3M mask for more than 24 hours. With the mask on, they showed improvement in heart rate variability, blood pressure, and stress markers for ischemia. All of these are considered risk factors for heart disease problems such as heart attacks and strokes, so any improvement in this objective data could have a major positive impact. Why is this so important? Because air pollution doesn’t just cause lung problems, it causes heart attacks and chest pain, and strokes. And besides small children, I’m most worried about older people with heart disease, and this study proves that wearing a mask on those super bad pollution days just may save their life, preventing a heart attack. These studies do have their flaws, especially their admitted fact that the control group wasn’t wearing a “placebo” mask, and perhaps the reported benefits are partly psychological as the subjects maybe were more relaxed while wearing the mask. But these are the best studies we have so far on the subject of masks, and I certainly am not going to wait around for better designed studies. I’m quite convinced that the underlying principle is quite robust and well proven: that decreasing exposure to air pollution improves your health. And we already know, from decades of construction work use, that N95-rated masks are designed exactly to decrease PM2.5 exposure, and that this PM2.5 is currently considered the most dangerous of the many harmful chemicals in the air. I will be spending a month and a half in Beijing next year. I will of course be wearing a mask and looking into indoor air purification options. Given those precautions, how much could the pollution affect me in that amount of time, both short- and long-term? I have had some problems with arsenic and mercury exposure in the past and have heard Beijing smog can carry those; this and the long-term affect on the lungs are my main concerns. Thank you! While protection from PM2.5 is the main concern, you might consider (but at 2-3X the cost) a R95 or P95 mask. They are partially (R95) or fully (P95) to oily vapors, and are some what durable, so you might be able to wear them longer to help amortize their higher cost. They do (3M brand at least) have a carbon layer, so they act almost like a mini air purifier, as most of the better air purifiers have have activated carbon (gas phase) filters beside a primary filter to help reduce PM2.5. The carbon layer should provide some protection from VOC, as they were designed for industrial/construction settings, its hard to be definitive how much better they work for your concern while you are in Beijing over a well fitting N95 mask. Speaking of fit, the importance of a proper fit of a mask can’t be overemphasized. Before you come to China, you might want to pick up some masks (not too hard to find online/in stores in most western countries) and practice donning a mask. 3M (and likely others) have videos that show you how to do it. You can try on youtube as well. You might even find a hospital that might that be willing to personally help you don your mask. Its not very hard to do correctly, but I think you’d feel better working it all out before your arrival. I don’t recommend it, but you could consider a N99 or N100 mask. They will filter out more PM2.5, but besides being very expensive, they (generally) are not comfortable to wear. If something is not comfortable, their is a greater chance you won’t use it consitiantly when air quality is bad in Beijing, meaning you be better severed with a mask you will wear more often than one that is just a few percentage points more effective that you ware less often. Thanks for the details, David. I’ve never tries an R or P series — does anyone have experience with them? Thank you so much! Excellent information. That helps a lot. I’ve recently read an article by you which I found to be really eye opening — in this article you were quoted saying that low quality masks give people a false sense of confidence and that it might make things worse, therefore it’s important to educate about masks and test them to find which ones are good. I kept thinking about this idea to the point where I wonder if we’re all fooling ourselves even with the 3M masks and all the various equipment when we live in this environment. Even the N95 or N99 masks do not filter various gasses which are common from cars and other sources — no doubt they fill the air in Beijing and other places and are known to be very harmful. They also fill our houses and air purifiers do not necessarily handle them (my guess is that they do not). Surely walking around at 200+ with N99 masks we keep inhaling these gasses, Even if we inhale zero 0 pm 2.5 particles what are the health consequences of chronically breathing these gasses? And if it’s so hard for adults to determine good fit it’s practically impossible to determine this for toddlers or children. I can also see my teen taking off his mask if his friends don’t have theirs own. MyHealth Beijing has been doing a great job focusing on masks to filter particulates, I hope that in the future it will take us to the next step of figuring out the health impact of the current environment even if we were to wear N99 particulates masks at all times. Thanks. Also, would be great to see some resources which analyze the actual content of pollution in the air, i.e. type of gasses etc. A number of masks on the market seek to address urban pollution beyond filtering PM2.5 and tout an “activated carbon” layer, such as the ICanBreathe models. Though no one mask may be able to significantly reduce all five of the major pollutants (particulate matter, ozone, carbon monoxide, sulfur dioxide and nitrogen dioxide), it will be valuable to hear more on available models which attempt this, and how to weight the importance of the other pollutants, beyond PM2.5. In terms of which pollutant is worst, I follow the WHO and other research which states that PM is the most serious in terms of mortality and disease. It has very strong direct evidence of population-wide disease. But I agree with you that it would be valuable to see more research, and I would love to see much better research on all the masks compared to health markers. I hope many teams are working on this right now.